Right, so. Once a year there’s a bit of an event held in Sweden which involves doing some skiing, lightly interspersed with being given buns and warm drinks, and later in the event, the worlds best tasting oranges and chocs. The race is held on the first Sunday in March, and is a 90 Km cross-country ski. My first year was 2010. 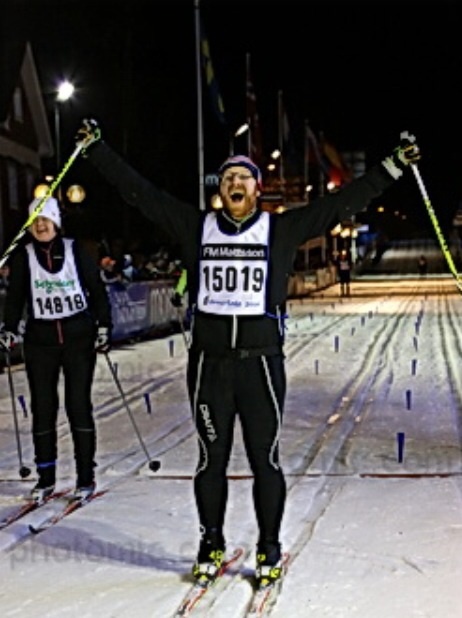 My training program went like this: Dec 2009 – learn to xc ski, Jan/Feb get a bit of practice in, March – Vasaloppet. I finished the race with a good 20 mins to spare before they closed the course (a little under 12 hours), so could take it easier in future events. In 2011 I shaved a bit off the time, and in 2012 a bit more. 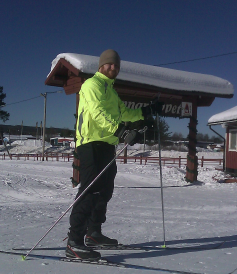 Training for 2012 involved skiing 10 km on snow before heading up to the event, and 8 kms on roller/LOLler skis. I couldn’t recommend highly enough not doing this little training. Mental note: don’t do this again. In 2013 the Vasaloppet kicked my ar5e, and after 62 hard km I got to Oxberg after the course had closed, and had to take an early bath/bus. Mental note: review the mental note from 2012 before 2014. In 2014, with the Vasaloppet booked up seconds after opening, I tried out the Öppet Spår (same course, different day) with a chum and laid the ghost of Vasaloppets past (2013) to rest. Me laying the ghost of Vasaloppet 2013 to rest.